One photo-etched fret; one resin part; instructions. Excellent casting and good use of PE to get the delicate wooden covers and drive prop in scale. Good colour notes. This is a nice addition to the weapons that can be mounted on Allied maritime bombers. This weapon was developed by the USN late in the war to counter the U-boat and, later, Japanese submarine menace. It was a small acoustic search-and-destroy weapon that could be dropped into the sea and which circled around an area seeking a submarine target at pre-determined depths up to 150 feet. It used hydrophones to detect the enemy and would then approach the target. It was a small weapon and carried about 40kg / 94lbs of explosive but was far less wasteful and vulnerable than other torpedo-carrying vessels/aircraft. Some 4000 were built and about 340 were launched against all targets, about 200 against submarines which resulted in 37 sinkings and 18 damaged. They were mainly used by American aircraft (142 launchings) but the British has success as well with 62 launches. Interestingly it was a USN Catalina and an RAF Liberator that each destroyed the first victims of the Mk24 on 14 May 1943. 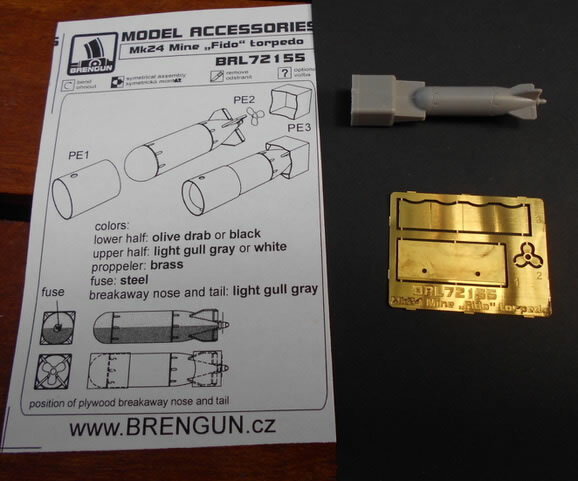 Brengun gives us a nice resin and PE rendition of this weapon used by the Allies in their battles with the submarine. The resin body is nicely cast and emphasises the small size of the torpedo, being only just 25mm / 1” long. The PE parts are for the wooden nose and tail covers which break away when it is dropped/launched, as well as the propulsion propellor. The instruction sheet gives detailed colour notes.